We are only able to ship to the address provided at checkout. eBay policy does not allow us to ship to any other shipping addresses. All large items that ship with freight service will require a confirmed daytime phone number, otherwise the carrier will not be able to deliver your package. Please ensure that your phone number is current with your checkout. I was looking for a not so large or to small TV for my condo. My sister purchased a TV for my daughters room and it was a samsung.Her TV is why I chose the Samsung due to the quality and picture. I received my TV with in a couple days.I Love this TV.The size is perfect, the picture is great, and I love the Smart TV apps.It was easy to learn how to operate and I have the choice to play music ( Pandora) or Netflix or my cable TV or Popular Movie app and more. I would recommend this TV to anyone. I do have a RCA flat screen in my bedroom. The picture is not as clear as the Samsung and of course not as smart as the Samsung. I am totally Happy aboiut this purchase and would do it again! Over-all this TV is on Parr w/my expectations after reading other reviews. As others stated the sound quality could be better, however these new "Slim line units" apparently do not allow space for a decent sized speaker. So that is what is to be expected !!! Compared to my not too old Sony of same size it was just before the new Slim line Fad started & it (the Sony)has much better quality sound !! So one must weigh out their priorities of needs/expectations... Other than sound I have no issues..
Awsome product for the price point! Would recommend this Smart HDTV! Great product for the price! Apps take patience to use. Picture quality is excellent after tweeking in settings. I bought this one because I have a 32" Samsung HD tv in my master bedroom and have enjoyed it. 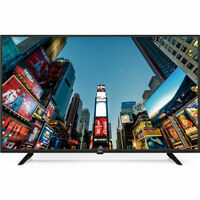 If your looking for a quality LED HDTV at a fair price then this smart tv is worth considering. I have a small living room, so this size works perfect. I would recommend doing homework first and check out the reviews online before making a decision. Perfect sized TV for our bedroom. Sound and picture are good, not great. Not that big a deal. I needed a TV that I can see, and wanted a Smart TV for the apps like Netflix, and a web browser, and this set had them. Plus I can read the ticker at the bottom of the TV without having to squint.